Welcome to the first of our new Object of the Week posts, where we'll be featuring staff and volunteer picks from the collections. This part of our blogging activity will incorporate our previous Picture of the Week posts, which appeared over on the main blog, but will now include selections from the whole of the Art Gallery & Museum collections, so expect everything from archaeology to art, and plenty in-between! To get things started, I thought it was about time that we explained the photograph used in the banner at the top of the page, so this week's pick is Lucy the Locust. I first came across Lucy when we were in the planning stages of our recent packing project. Despite the fact that Lucy was hiding on a slightly neglected shelf in the corner of the Natural History Store, it was hard not to notice her - a large insect (she's about 70mm long), nestling on a bed of cotton wool in a rather smart black display box. 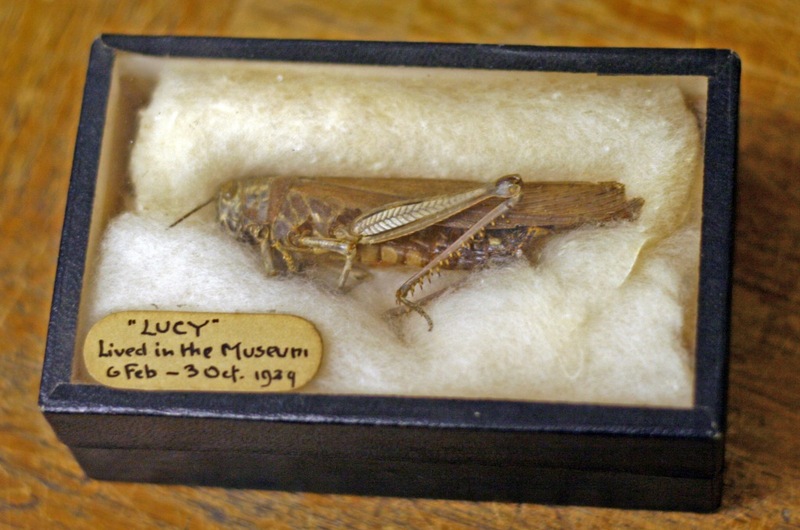 What really grabbed my attention, though, was the label on the box: "'Lucy' Lived in the Museum 6 Feb - 9 Oct 1929". This immediately got me thinking - who had owned Lucy? Where had she come from? And why was she kept at the museum? We've had some fantastic support recently from members of the Bedfordshire Natural History Society, who've been volunteering a great deal of time to help with packing the collections. One of our volunteers thought they might be able to help get a proper identification, so Lucy was very carefully removed from her box and photographed. 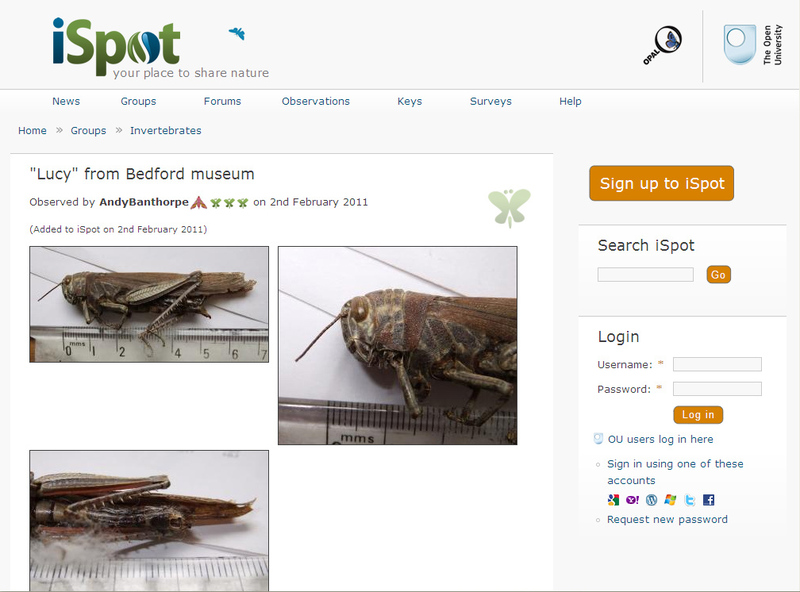 This photo was posted on iSpot, a website aimed at helping people identify things in the natural world. Within minutes, Lucy had been identified (you can see the results here) as an Egyptian Grasshopper (Anacridium aegyptium), a circum-Mediterranean species. A big indicator is the striped eyes. It has been known for Egyptian Grasshoppers to have been accidentally introduced into this country on produce, something which apparently still happens from time-to-time today. There's a strong chance, then, that Lucy was a stowaway on produce imported into Bedford from somewhere in the Mediterranean and that she was then brought into the museum, where she became one of the more unusual exhibits! But might there be another explanation? Around this time (the late 1920s), the Bedford Modern School Museum (as it was then) was under the curatorship of PG "Piggie" Langdon and a number of Egyptian, Mesopotamian and Mediterranean antiquities were entering the collection. Might Lucy have been accidentally brought over in a packing crate? It's a very remote possibility I admit, but it would make a lovely story. Nice new feature. But that Locust made me have a bit of an Alien moment. Let's leave Lucy in the stores hmm?